In what appears to be a first for Apple, data collection for Apple Maps is now being done on foot and not just in vehicles, photos published on Friday reveal. 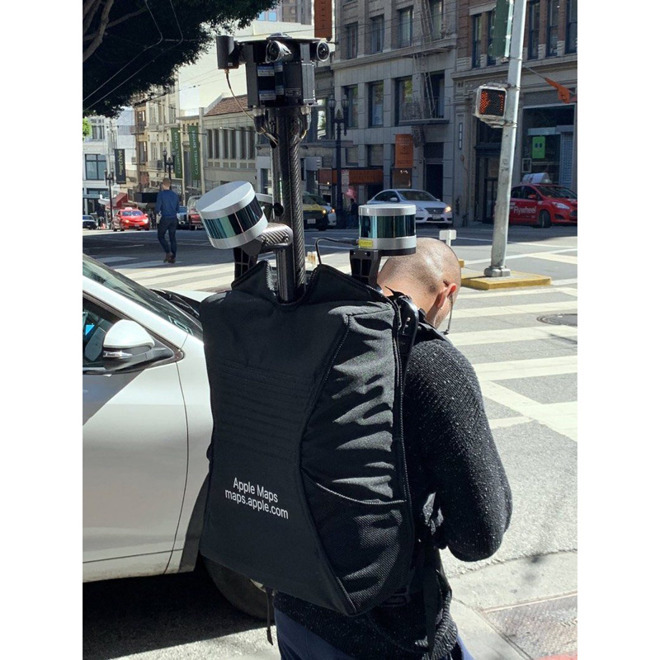 At least one person has been spotted roaming San Francisco with a large, Apple Maps-branded, sensor-laden backpack. The gear appears to be similar to that used on Apple's auto rigs, incorporating cameras, GPS, and LIDAR. The photos were shared with MacRumors by reader Dante Cesa. While it's uncertain why Apple is doing on-foot collection, the likely answer is an attempt to improve pedestrian directions in major cities. Apps like Apple Maps will often use a limited interpretation of where people can walk, resulting in unnecessary delays. The company just recently deployed a new car to its recon fleet, the Subaru Impreza hatchback. Until recently the company had been depending solely on minivans. In June, Apple finally revealed that its vehicles were being used to produce first-party mapping data. The company's Maps app started out with content from Google, but that was ditched in 2012 for a hodgepodge of sources including TomTom. Apple has frequently been criticized for missing or inaccurate information, even if complaints have diminished in the past six years.